Thesis Abstract | Dissertation Abstracts Thesis Library - Comparative Analysis Of The Editorials Of Pakistani English Dailies (dawn, The News, The Nation, Daily Times, The Express Tribune And Pakistan Today) Regarding United States Diplomatic Cables Leak. 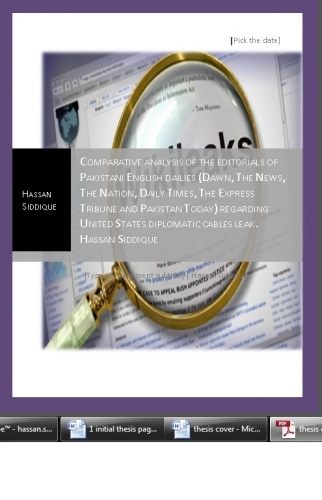 ThesisAbstracts > Arts > Comparative Analysis Of The Editorials Of Pakistani English Dailies (dawn, The News, The Nation, Daily Times, The Express Tribune And Pakistan Today) Regarding United States Diplomatic Cables Leak. This research project focuses on the editorial coverage of US diplomatic cables leaks in the selected newspapers (Dawn, The News, The Nation, Daily Times, The Express Tribune and Pakistan Today) during November 29th to December 31st, 2010. The objective of the study is to find out the portrayal of US and its policies in the Pakistani English press. The study also discusses the policies of the selected newspapers regarding US diplomatic cables leak and US, therefore the policies of the selected newspapers were discussed in detail. The study has embodied both, quantitative and qualitative techniques to determine the findings of the research. Theoretical insight is taken from the postulates of the theory of Framing. In-depth conclusion is also drawn under the light of the selected theory and the findings. The study also proposes future research topics related to this study. English Press, Editorials Policies, Wikileaks, Cablegate, Pak-US Relations. Submission Details: Thesis Abstract submitted by Hassan Siddique from Pakistan on 01-May-2012 20:39. Abstract has been viewed 2404 times (since 7 Mar 2010). Great care has been taken to ensure that this information is correct, however ThesisAbstracts.com cannot accept responsibility for the contents of this Thesis abstract titled "Comparative Analysis Of The Editorials Of Pakistani English Dailies (dawn, The News, The Nation, Daily Times, The Express Tribune And Pakistan Today) Regarding United States Diplomatic Cables Leak. ". This abstract has been submitted by Hassan Siddique on 01-May-2012 20:39. You may report a problem using the contact form.